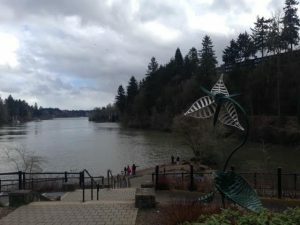 I just came in from a nice long walk along the Willamette River that inspired me to tell you about George Rogers Park. George Rogers Park is located on South State Street where it intersects with McVey. 26 acres in size, it includes an athletic field, tennis courts, a play ground, river access, and probably most famously, the Iron Furnace. The river front has got a sandy beach and it’s a good spot to fish, put in a canoe, and just generally play in the water. The Iron Furnace is on the National Register of History Places. 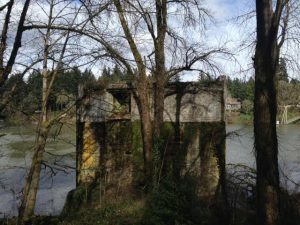 Oswego’s history goes back to the day when iron ore was discovered in the hills around Sucker Lake (now Oswego Lake) and the industrialists of early Oregon thought that Lake Oswego would become the Pittsburg of the West. It actually was a very significant part of Oregon history. Prior to 1867, the iron used anywhere on the West Coast, including San Francisco, Seattle, and Los Angeles, had to be brought around the horn of South America from the East Coast. The Iron Furnace in Lake Oswego changed that. And when you see iron work on old buildings in downtown Portland, you are likely looking at iron that was smelted in Lake Oswego. 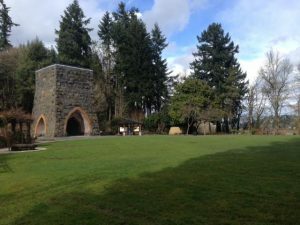 George Rogers Park carries this theme artistically through the arbors, stone work, and even the shape of the grills on the fire rings. It’s a lovely park. It has picnic areas that are covered and can be reserved for parties and special events. One of the strangest houses in Lake Oswego can be seen along this path. I am going to tell you the story as it was told to me, by a contractor who worked on the house when it was being built. The house sits on a concrete piling that I believe was part of either the iron ore manufacturing or perhaps the cement manufacturing that happened slightly North of the spot in about the 1950’s. Somehow the piling was aquired by a private party who decided to build a house on it. The house was about 75% built when the owner ran out of money and it was abandoned. To my knowledge it has never been lived in. The glass windows and bridge access that I remember from when I first saw it are long gone. Now it almost looks haunted. I’m sure many walkers wonder what they are looking at when they see it today. So now you know. We may not yet be having hot sunny days, but we are having beautiful winter-almost-spring-days like the one that we have had today. Get out and enjoy it!